We are sad to report that another one of our adopters has lost her beloved greyhound to bone cancer. Diego lost his battle April 9. He had been adopted by Paula Thompson in October of 2006. He would have been seven in September. We got Diego from New Hampshire from an adoption kennel. When we took him, his care takers made us promise that we would only find him the very best home. He had a very badly broken leg that took a lot of time to heal and in the time that he was in the adoption kennel, everyone fell in love with him. He was a very exceptionally sweet dog. When we placed him with Paula she had to promise to keep in touch with us so that we could reassure the people at the kennel in New Hampshire that he had a good home (as they wanted to know that he would be OK). She kept her promise. Paula has been a very responsible adopter and has been a good volunteer for our group. She did many meet and greet events for us at the Hagerstown Petsmart. 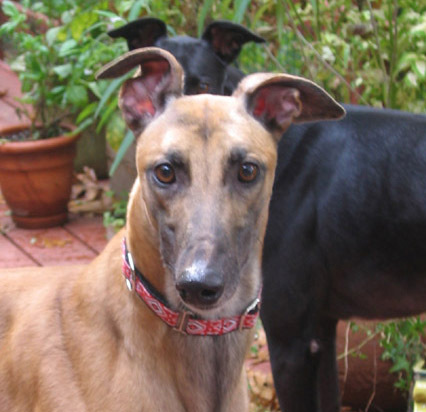 She has always kept in close contact with us and eventually adopted two other greyhounds from us. We know for sure that Diego got the home his previous care takers had wanted for him. He was greatly cherished and will be greatly missed. Run pain free sweet boy.